Nose: Delicate bouquet of tart and mushroom. Orange marmalade. Palate: A slight taste of marmalade on the palate that develops into vanilla and honeyed notes, with gingerbread and soft spice such as ginger. Named after the unforgettable harvest of 1987, this Vintage Cognac will transport you back to the Unlike the other Cognacs in this range, the eaux-de-vie of the Hine Millesime 1987 Cognac has been aged in the cellars in Jarnac from start to finish, resulting in a Cognac that is a testament to the Premier Cru. Distilled in 1987, bottled in 2003 - certain years provide such a favorable climate, that the harvest is of an exceptional quality. The growing season of 1987 was somewhat tumultuous; there was a very cold winter, lots of rain in the mid-summer, followed by a very hot August and September. The result was some incredible vintage Cognac! Hine Cognac decided to gather the eaux-de-vie solely from the Grande Champagne; the Cellar Master possesses generation-long knowledge that allows him to know the precise qualities for a fantastic Vintage. This 30 year old Vintage Cognac is a fine example of everything that makes the Grande Champagne so highly coveted; it is an ode to the chalky soil, the millions of years of fossilization, and the long finish in the mouth. The Hine 1987 Grande Champagne was released in early 2017 alongside an Early Landed edition. Grande Champagne Vintages such as the Hine 1987 Cognac are aged in special cellars under the watchful eye of the Cellar Master. Such a fantastic harvest cannot be recreated exactly as it once was, so quantities are limited. 255 years of Cognac history; all of it begins when a young Englishman from Dorset traveled to Charente to learn the secrets of this spirit. The Hine vineyards are located in the village of Bonneuil - 70 hectares of Ugni Blanc variety grapes, to be precise. 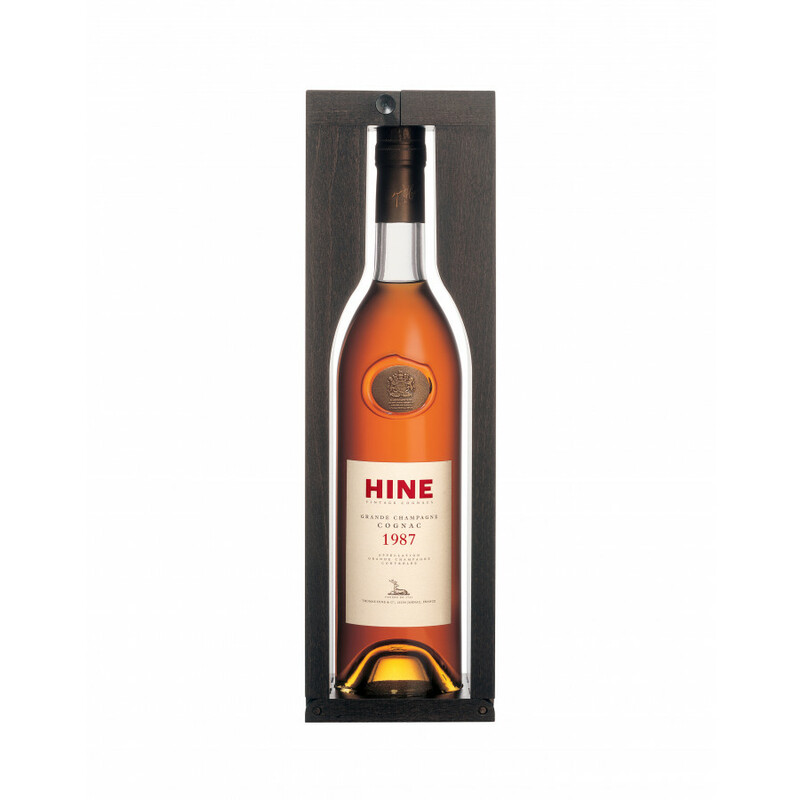 Hine Cognac have come to develop a reputation for their exceptional Vintage Cognacs, and have come to identify themselves best with the limestone-rich soil of the Grande Champagne. Once harvested, the grapes are pressed and distilled on the lees to bring out the careful acidity of the white wine - a quality that is celebrated at Hine Cognac. The eaux-de-vie are then placed into the French oak casks, not to alter the flavor entirely, but to enhance it. They pick oak with a fine grain, and then toast it lightly to bring out its aromatic qualities. It is this very stage of the process that gives their Cognac that shimmering amber color. The Hine Vintage 1987 is born. The best way to appreciate a Vintage Cognac is neat. The bottle is simple and lets the Cognac do the talking; the labeling is simple, stylish, with Her Majesty’s seal on the neck.